Elsa Andersson was the first Swedish female pilot and parachutist. Elsa Andersson was born in 1897. She grew up on Petersgård in Strövelstorp, in northwest Scania. It was a large farm, which her parents, Edvard and Alma Andersson, managed on behalf of Vegeholm estate. Elsa Andersson was the eldest child and lost her mother when she was only six years old. She developed an interest in machines and tools at an early age and became very close to her father. After attending an exhibition in Åstorp in 1913 where she watched an aerial display by the piloting pioneer Enoch Thulin, her deepest wish was to learn how to fly. In 1919 she was accepted as a student at Thulin’s flight training school, which was the first school in Sweden for both private and military flight training. It was presumably Elsa Andersson’s father, who also worked as a lay assessor and auctioneer, who paid for the expensive training, which cost 2,000 kroner. Students were also required to make a deposit of the same amount to cover possible injuries. 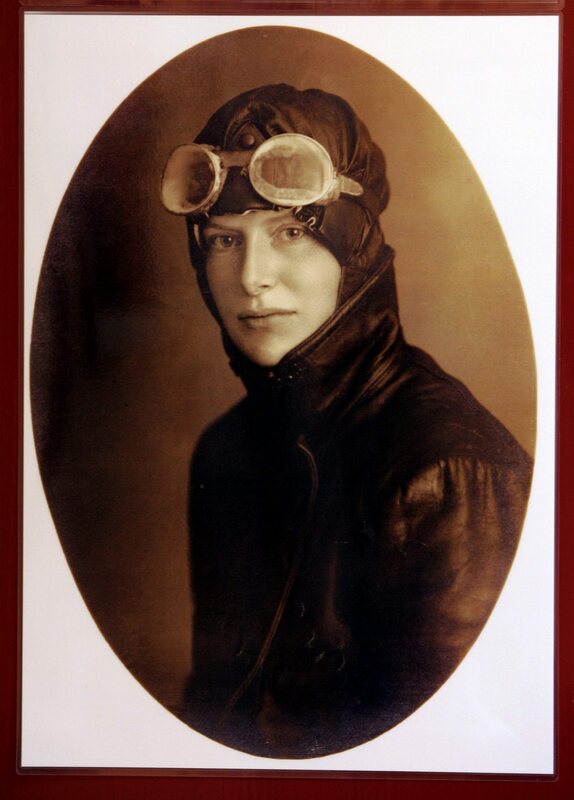 Elsa Andersson had already obtained her driver’s licence in 1919 and, after having learned to fly, she wanted to learn to parachute. In September 1921 she was certified as an authorised parachutist by the parachute maker Otto Heinecke in Berlin. It seems, however, that she never actually made any jumps from planes in Germany. Just a few days after returning to Sweden, in front of several thousand spectators, she undertook her first genuine parachute jump from 700 meters height at the military training base at Näsby near Kristianstad. One week later she performed another acclaimed parachute jump at Berga training field in Helsingborg. The Örebro flight company quickly snapped Elsa Andersson up as a display pilot and parachutist. The company organised an aerial display show near Askersund on 22 January 1922 at which the Scanian aviatrix was the main event. She was to parachute from a height of 700 meters. Elsa Andersson used the same parachute which she had used on previous jumps but this time she was unable to get it to open until she was 50 meters from the ground. She died on impact. The inquiry into this fatal accident concluded that the parachute’s ripcord had become entangled around Elsa Andersson’s arm, fixing the parachute bag to her back and thus preventing the parachute from opening. It is possible that the fatal outcome was related to the fact that Elsa Andersson had jumped from an upright standing position on the wing instead of jumping out of the cockpit. Elsa Andersson’s death became a major news item in the newspapers. Her father received royal condolences from Queen Victoria and Kungliga Svenska Aeroklubben (the Royal Swedish Aeroclub). The entire village attended Elsa Andersson’s funeral at Ströveltorp church, and she is buried in the parish cemetery. In 1996 Jacques Werup published a book on Elsa Andersson entitled Den ofullbordade himlen. It was later dramatized by Jan Troell in 2001 as a film entitled Så vit some en snö, which was nominated for the Guldbagge Awards. In 2010 one of the Skånetrafik trains was named after Elsa Andersson. Elsa Theresia Andersson, www.skbl.se/sv/artikel/ElsaAndersson, Svenskt kvinnobiografiskt lexikon (article by Liselotte Fritz), retrieved 2019-04-19.